Has God given you a dream or desire to be more for Him or be used by Him in ministry, yet, it just doesn’t seem to be happening? I know I’ve been there. Actually, I spent a lot of years there, and it has only been recently that God started moving on my desire. Oh, how I wish I would have read this book sooner. 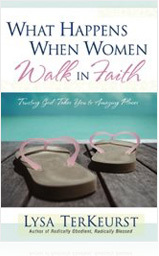 Lysa TerKeurst’s What Happens When Women Walk in Faith is a book about following your God-given dreams, yet it is about so much more. In her book, Lysa equips us with the encouragement and knowledge to “keep on keeping on” when life’s disappointments and distractions try to come between us and God’s plan for our lives. The whole premise of the book is that God gives us dreams tailored for our own talents and His purposes. But just like the Israelites, we must grow and overcome giants to get to our promised lands. The bad news is that there is no short cut (just grow quickly) to the grand prize; however, the good news is the best part of the whole process is the process. The process is where we dig down deep and not only grow, but develop strong relationships with God. 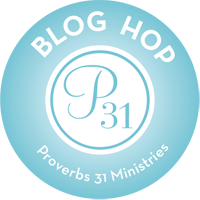 God is our grand prize, not the fulfillment of our dreams. Death: Coming to the end of your ability to make things happen seems like death to you, but to God, this is the only way to new life with Him. Lysa’s own ministry began with a dream, but it didn’t just go from dream to reality. No, she also had to go through the 5 phases in order to become the woman, writer, speaker, teacher, business woman she is today. This is what I like best about Lysa; she is not shy about sharing her experiences, even her dirty laundry, in order to lead others into a stronger relationship with Christ. I also like how she gets us to look at the same Bible stories we have read time and time again with new eyes. I will never look at the stories of Abraham, Moses, and Joshua the same again, and I bet you won’t either after reading this book. This author goes to my church and occasionally our pastor has her preach when he is out of town. I will definitely add this book to my ‘to read’ list. Oh, how awesome that would be to go to the same church as such an amazing author! It really is one of my favorite books and I have gone back to it time and time again. Next Next post: The Sneaky Little Sin Rides Again!